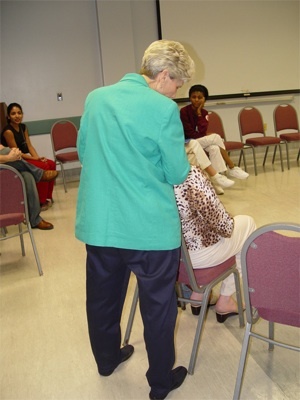 Ann Fuller, RN, CRT, Quantum-Touch Practitioner and Tampa Bay AHNA Network Leader (I presided as the new network leader), Doris E. Guillory, Certified Quantum-Touch Practitioner/Instructor, several nursing students and local nursing staff were all in attendance.Those attending participated in Quantum-Touch healing after back ground discussion was presented by Doris. The meeting was approximately 45 minutes long and then afterwards, Doris and I ran energy for 5 people for the rest of the hour long presentation. One of the students was having issues with his ankle and wrote to me the next morning that he felt wonderful and that his ankle was completely better. The woman that Doris ran energy on is not only a full time nursing student, but her young son has recently been diagnosed with cancer. She looked completely exhausted. (I was worried about her when she first came into the room at the beginning of the meeting and it was all I could do to keep from running over to her and scooping her away to do a session with her.) When she left the room (the last to leave b/c Doris and I spent a few minutes with her talking), she looked brand new. I ve not heard from her yet (they are in the midst of finals). Having Doris speak was a wonderful treat for me personally. It is my first year anniversary of being involved with QT and she was my first teacher.